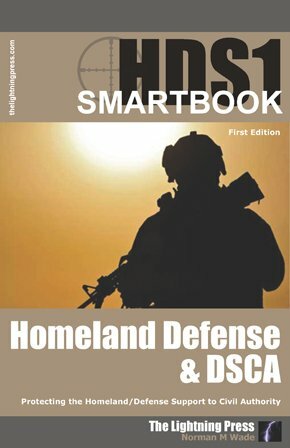 HDS1: The Homeland Defense & DSCA SMARTbook chapters and topics include homeland defense (JP 3-28), defense support of civil authorities (JP 3-28), Army support of civil authorities (ADRP 3-28), multi-service DSCA TTPs (ATP 3-28.1/MCWP 3-36.2), DSCA liaison officer toolkit (GTA 90-01-020), key legal and policy documents, and specific hazard and planning guidance: wildland fires, wind storms, earthquakes & tsunamis, floods, winter storms, chemical biological radiation nuclear (CBRN) events, and national special security events (NSSE), plus more. Homeland Security is a concerted national effort to prevent terrorist attacks within the US; reduce America’s vulnerability to terrorism, major disasters, and other emergencies; and minimize the damage and recover from attacks, major disasters, and other emergencies that occur. Homeland Defense is the protection of US sovereignty, territory, domestic population, and critical infrastructure against external threats and aggression, or other threats as directed by the President. Defense Support of Civil Authorities (DSCA) is support provided in response to requests for assistance from civil authorities for domestic emergencies, law enforcement support, and other domestic activities, or from qualifying entities for special events. Disaster management (or emergency management) is the term used to designate the efforts of communities or businesses to plan for and coordinate all the personnel and materials required to either mitigate the effects of, or recover from, natural or man-made disasters, or acts of terrorism. In the past decade alone, natural disasters of considerable severity resulted in 699 Presidential Disaster Declarations, an average of nearly six per month. The US Armed Forces have a historic precedent and enduring role in supporting civil authorities during times of emergency, and this role is codified in national defense strategy as a primary mission of DOD. The nature of DSCA in the US presents a unique challenge based on the history of the country and the interaction of the federal, state, local, territorial, and tribal governments and private and nonprofit organizations. US military personnel must understand the domestic environment so they can employ military capabilities efficiently, effectively, and legally. Perhaps one of the greatest challenges for a military staff is operating in or near the homeland and being subject to the inherent legal and jurisdictional responsibilities that accompany such operations. This challenge is set against the evolving range of threats to the homeland–to countering transnational organizations and individual actors of concern internal and external to the US. 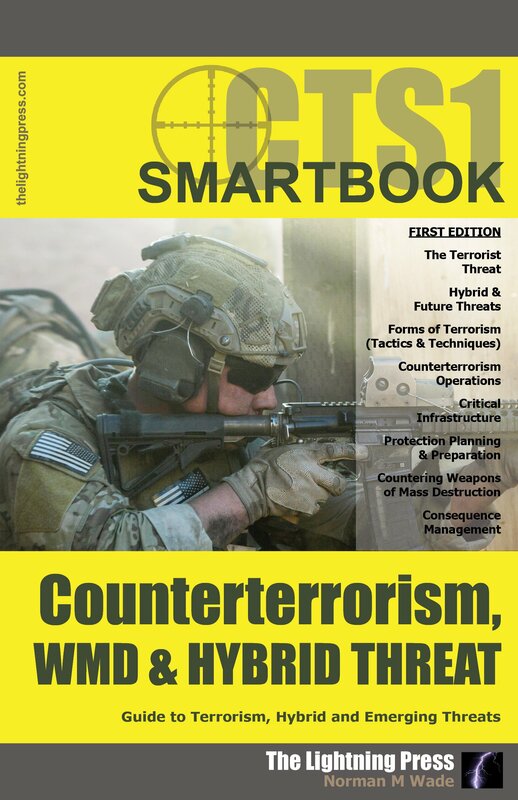 CTS1: The Counterterrorism, WMD & Hybrid Threat SMARTbook topics and chapters include: the terrorist threat (characteristics, goals & objectives, organization, state-sponsored, international, and domestic), hybrid and future threats (forces, organization, operations & tactics), forms of terrorism (tactics, techniques, & procedures), counterterrorism (strategy, fundamentals, command, planning, and operations) critical infrastructure (identifying weaknesses, risk management, and cyber threats), protection (warfighting function, supporting tasks, and planning), countering WMD (WMD weapons, planning, and execution), and consequence management (all hazards response, domestic, international and DoD-led CM). * This is the second printing of CTS1 (Jul 2017), incorporating an updated DNI World Threat Assessment and additional materials from START/GTD. An asterisk marks changed pages. A hybrid threat is the diverse and dynamic combination of regular forces, irregular forces, and/or criminal elements all unified to achieve mutually-benefiting effects. Hybrid threats are innovative, adaptive, globally connected, networked, and embedded in the clutter of local populations. They can operate conventionally and unconventionally, employing adaptive and asymmetric combinations of traditional, irregular, and criminal tactics and using traditional military capabilities in old and new ways. Counterterrorism activities and operations are taken to neutralize terrorists, their organizations, and networks in order to render them incapable of using violence to instill fear and coerce governments or societies to achieve their goals. The purpose of CT is to disrupt, isolate, and dismantle terrorist organizations and networks to render them incapable of striking the homeland, US facilities and personnel, or US interests abroad. CT also includes crisis response operations to respond to imminent terrorist threats or incidents when preemption and preclusion are not successful. In addition to increasing law enforcement capabilities for counterterrorism, the United States, like many nations, has developed specialized, but limited, military CT capabilities. Weapons of mass destruction (WMD) are chemical, biological, radiological, or nuclear (CBRN) weapons or devices capable of a high order of destruction and/or causing mass casualties. The terrorist threat is amplified by the proliferation of WMD and their potential use by terrorists. The existence of these materials and the potential for use by actors of concern precipitates the need to plan, prepare for, and counter their use. Critical infrastructure is a term used by governments to describe assets that are essential for the functioning of a society and economy - the infrastructure. Protection is the preservation of the effectiveness and survivability of mission-related military and nonmilitary personnel, equipment, facilities, information, and infrastructure deployed or located within or outside the boundaries of a given operational area. Consequence management refers to measures to protect public health and safety, restore essential government services, and provide emergency relief to governments, businesses, and individuals affected by the consequences of terrorism. Incidents involving CBRN material produce a chaotic and hazardous environment requiring immediate response to minimize pain and suffering, reduce casualties, and restore essential infrastructure. Responders at the local, state, and federal levels may be overwhelmed by the magnitude of the incident, and U.S. DoD forces may be requested to provide additional support through the national response framework (NRF). Every profession is made up of tools and ways to use them. The same is true for the ICS. This means that there is an art to how tools are used to make them the most effective. The better someone understands how the tools and methods interact with each other, the greater that person’s potential for making the ART of emergency management work smoothly. By having responders who use a common methodology across the whole spectrum of the response community the opportunity for similar efficiencies in application of the tools (the art) becomes a collective efficiency. 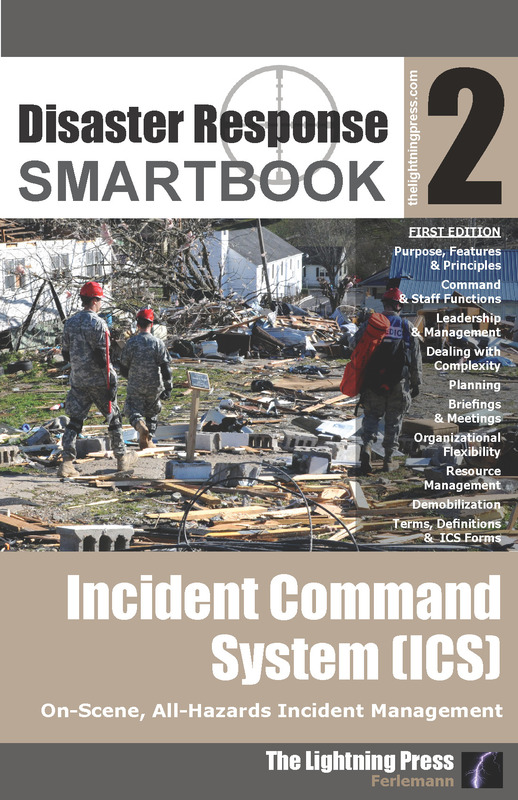 The ICS SMARTbook provides a detailed explanation of ICS as outlined in FEMA Emergency Management courses 100, 200, 300, 400, 700, 703, and 800; including 2015 updates. It is designed to serve as an introduction to ICS concepts, methods, and organization, as a pocket reference for experienced responders, or as a desk reference for emergency planners, community leaders, or any responder involved in the Multiagency Coordination process. Incident Command System chapters and topics include ICS Purpose, Features and Principles; ICS Command and Staff Functions; ICS Leadership and Management; ICS Dealing with Complexity; ICS Planning; ICS Briefings and Meetings; ICS Organizational Flexibility; ICS Incident and Event Management; ICS Resource Management; ICS Resource Management Process; ICS Demobilization; ICS Terms and Definitions; and ICS Forms. 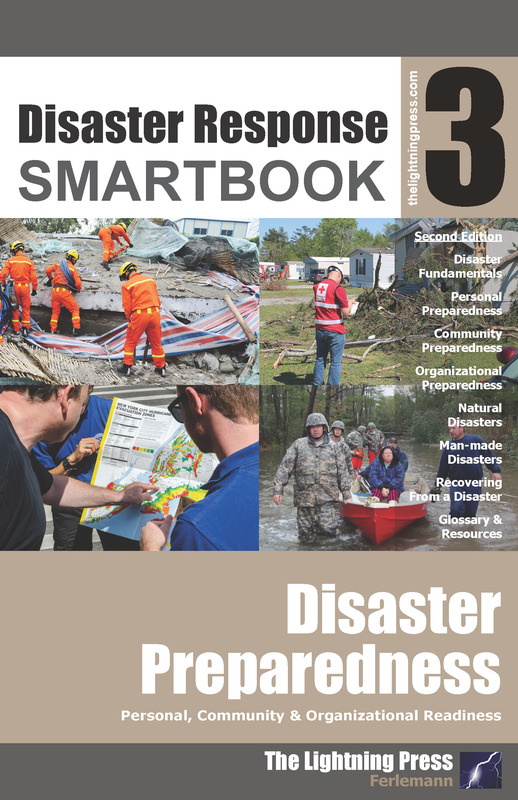 Disaster Response SMARTbook 3 – Disaster Preparedness, 2nd Ed. (Personal, Community & Organizational Readiness) is the updated 376-page second edition of this book. The material has been completely updated and refocused as a planning and preparation guide with 128 additional pages of material. Topics include disaster fundamentals, personal preparedness, community preparedness, organizational preparedness, natural disasters (hurricanes, earthquakes, wildfires, floods & landslides, volcanoes, tsunamis, tornadoes, drought, famine & extreme heat, blizzards & ice storms, outbreaks, epidemics & pandemics), man-made disasters (hazardous material incidents, nuclear events, explosions & chemical spills, civil disturbances, terrorist incidents, active shooters, cyber threats), and recovering from a disaster. Disaster management (or emergency management) is the term used to designate the efforts of communities or businesses to plan for and coordinate all the personnel and materials required to either mitigate the effects of, or recover from, natural or man-made disasters, or acts of terrorism. Individuals can make a difference in their own community but not everyone has bought into preparedness. Research on personal preparedness indicates that individuals who believe they are prepared for disasters often are not as prepared as they think. In addition, some admit they do not plan at all. Our nation’s emergency managers, firefighters, law enforcement officers, EMT/paramedics, and other emergency responders do an incredible job of keeping us safe, but they cannot do it alone. We must all embrace our personal responsibility to be prepared -- in doing so, we contribute to the safety and security of our communities as well. Planning and preparing can make a big difference in being safe and keeping an organization operational during and after a disaster. The ability to maintain or quickly reestablish operations or organization processes requires a focus on preparedness, advance planning, and relationships with external partners and community leaders.